Quilting is so flippin' Cool!I've been working on my Typography Challenge project which will include some patchwork. I came across some cool quilting techniques. My favorite new technique is making 4 half square triangles (HST's) with 2 squares of fabric and 2 diagonal cuts. I found out about it from this tutorial on whipup.net. It's a very clever technique. I didn't need to measure any angles, which I think is a major plus. Go to HERE to learn how to make 8 HST's at a time. Blows your mind doesn't it? I went a step beyond the HST's and came up with a . . . a . . . I don't what you'd call it but it looks like step number 6 in the first series of pics below. Then I started playing around with the arrangement of the new blocks and came up with so many different looks that I made 2 more collages to share. There are many more variations but I'm sure you don't want to scroll down through miles of pictures of the same 4 blocks. Begin with 2 squares right sides together. Stitch around the perimeter with a 1/4 in. seam allowance. With your rotary cutter and acrylic ruler, cut from corner to corner as shown. Open up and look at what you have! Press. Now you have 4 perfect HST's. Cut each square in half creating 2 rectangles. Rearrange the rectangles and stitch together as shown. Start with your 4 HST's that have been split, rearranged and sewn back together. Does this look familiar? Kind of like a star or a pinwheel? Now check it out with the small diamond center. Keep flipping them around and discover new variations. Again, starting with the 4 HST's that have been split, rearranged and sewn back together. Some large and leaning diamonds. A variation of the previous picture. I've got a lot more to learn about quilting. However, I don't find that idea daunting at all. I'm loving this new journey of discovery and experimentation. Have you ever spent the afternoon rearranging quilt blocks? Can you suggest any other simple quilting shortcuts that I could throw into my bag of tricks? If you're reading this before March 31, 2012, go HERE and sign up! Hi Rikka! I hope I'll be able to catch up on your blog more frequently. I can recommend the tutorials by the Missouri Star Quilt Co. (they have a ton of tutorials). They teach you how to make various quilt blocks that can be used in many ways. Some of them are really ingenious! I'm sure you know ohfransson.com. She does gorgeous work. A tiny bit of it is regarding rearranging quilt blocks. I have finally begun my first quilt. It's just a simple zig zag quilt, but I had to concentrate as I laid it out on the floor. I got quite excited as it began to take shape and look how it should. I can NOW relate to your excitement in this post. 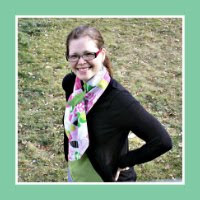 Thanks for linking up your quilting projects, Rikka. I AM going to make a rag quilt like your pink one... not sure when, but it's getting closer... LOL!!! That is really neat!! I will have to do this. Thanks for sharing! Hi. .just found you and love your tutorials. ..another idea. .in the 1st series of pictures, #5, if your block was bigger, you could cut your HST in 4's. (Across center up/down, and side to side) and get 4 blocks (2 solids and 2 Hst's) isn't that neat?